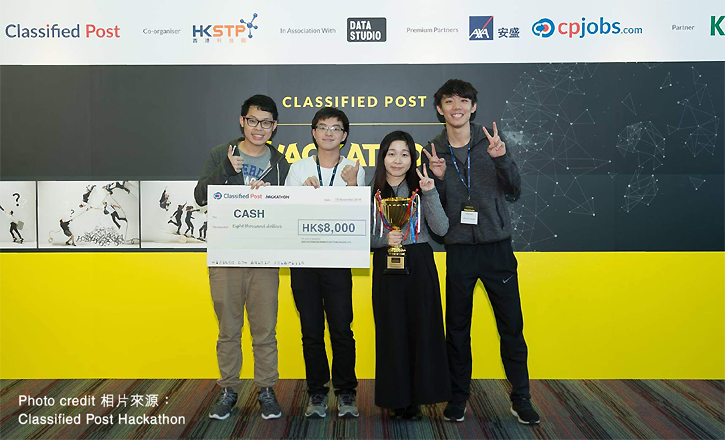 Three Year 4 computing students from the OU teamed up with a student from the Hong Kong Baptist University (HKBU) and participated in the Classified Post Hackathon organized by the South China Morning Post. Among some 30 teams from various tertiary institutions, the "OU x BU" team won the championship and a cash prize of $8,000 with their creative digital solution. All participating teams will be assigned to 2 different categories – "Media" or "Insurance" by ballot. The "OU x BU" team was assigned to the latter and was given the task to create an innovative digital solution in 24 hours to improve the public image of the insurance sector and help attract new talents to the industry. Their winning solution is a role-playing game which simulates the various situations that people would face in their daily life. It is expected that through this game, people could have a better understanding of the relationship between insurance and daily life, and also learn more about the insurance industry.